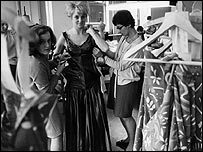 The BBC's archive of coats, dresses and frilly shirts has been bought by Oscar-winning costume house Angels. It ends a period of uncertainty for the BBC costume department, which ceased trading in February after initial attempts to sell its collection failed. More than one million items from shows such as Ashes To Ashes and Blackadder will be transferred to Angels' HQ in Hendon, north London, from next week. Angels is the UK's biggest supplier of costumes to the film and TV industry. The family-run business has provided tunics to Star Wars, loincloths to Gladiator and ruffs to Elizabeth: The Golden Age. It won its first Oscar for costume design with Laurence Olivier's Hamlet in 1948, and has picked up a further 29 Academy Awards. Among those were prizes for films such as Titanic, Gandhi, Memoirs of a Geisha and The English Patient. BBC Costume and Wigs was part of BBC Resources, a wholly owned commercial subsidiary of the BBC. It began life on the third floor of Television Centre in west London as a store for the collars and cuffs worn by early TV presenters and newsreaders. Over the next 50 years, it grew into an operation hiring out 15,000 outfits a year, with a turnover of around £1.3 million. Last year, BBC Resources announced it was to was to close the department and dispose of the stock. However, an early bid - thought to be from prop hire company Superhire - fell through. The deal with Angels means that the archive of costumes will remain available for use by British film industry professionals and international productions in the UK. The BBC's collection of around 10,000 wigs has been sold separately to a new company formed by former employees of the costume department. Chairman of Angels the Costumiers, Tim Angel, said he was "very excited" by the acquisition. 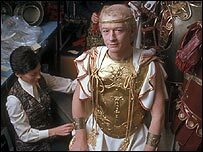 "I've been working in the costume business for 40 years and one of my first briefs was to try and get BBC work," he said. "So I'm quite chuffed we've managed to buy the stock, because it keeps it all together, and I think that's important". Angels will also take on four staff from the BBC's costume department to "provide continuity". Around 20 staff worked in the department before it closed in February, and several have been made redundant. It will take about six weeks to transfer the costumes to Angels' warehouses, which already contain six-and-a-half miles of costumes.